﻿ News Bharati - Here's the Interim Budget serving the individuals and salaried tax payers..! News Bharati - Here's the Interim Budget serving the individuals and salaried tax payers..! Here's the Interim Budget serving the individuals and salaried tax payers..! New Delhi, February 1: With the Lok Sabha elections round the corner, the Acting Finance Minister on Friday presented the details of the government income and expenditure within the interim budget 2019-20. Though Goyal told an all-party meeting that a “budget is a budget” and there is nothing like a vote-on-account, Prime Minister Narendra Modi clarified to the Opposition that this is an interim budget. “I am deeply conscious of the absence of Arun Jaitley,” Goyal started the speech wishing the Jaitley of speedy recovery. Goyal said that the Modi government has reversed policy paralysis gripping nation. “We have prepared the base for stronger growth. Moving towards are dream of new India by 2022. I can proudly say that India is solidly back on growth track", he said. “We have restored the image of the country and raised the self confidence of the nation. With the nation striving to the ‘New India’, the government is working for progress overall. ", he added. Besides a high growth rate, the government contained a double-digit inflation rate and restored fiscal balance, Goyal said. The average rate of inflation between 2009-14 was a back-breaking 10.1 percent, he said. Compared to this, the Modi have brought down average inflation to 4.6 percent which is lower than the inflation during the tenure of any other government. If we had not controlled inflation, our families would be spending 35-40 percent more than what they are spending today for basic necessities. “The government revised fiscal deficit estimate for year 2019-20 to 3.4 per cent of the GDP compared with the budget estimate of 3.3 per cent. The Big Numbers FY19 budget gap 3.4 per cent of GDP vs 3.3 percent India attracted $239 billion FDI in last five years”, he added. The acting Finance Minister announced that the individual taxpayers having annual income up to Rs 5 lakh will get full tax rebate. “Individuals with gross income up to Rs 6.5 lakh will not need to pay any tax if they invest in provident funds and prescribed equities”, he said urging the individuals to make investments in the various policies. “The standard tax deduction for salaried persons has been increased from Rs 40,000 to Rs 50,000. Gratuity limit has been increased from Rs 10 lakh to Rs 30 lakh. Pension scheme for unorganised sector workers with monthly income up to Rs. 15,000 will be given. Assured monthly pension of Rs. 3,000 after they retire on reaching 60”, he informed focusing on the salaried and pensioners. Citing the occasion, he also informed that the direct tax collections have been increased from Rs 6.38 lakh crore in 2013-14 to almost Rs 12 lakh crore and that the tax base is up from Rs 3.79 crore to 6.85 crore. The government has improved technology to improve the income tax department making the filing procedure digital and easy for the users. This improved system for the income tax filers will be processing the income tax returns within 24 hours including the payment of refunds if any. “Within the next two years almost all verification and assessment of returns will be done electronically. 18 percent increase in direct tax collections in 2017-18, 1.06 crore people included in the tax base. Also, more than 1 crore people have filed IT returns for the first time, after demonetization,” Goyal added. Stressing at the TDS thresholds, the house lauded the decision of raising the TDS limit for the interest on FDs from Rs 10000 to Rs 40000. Also the same for the rent have been raised from Rs 180000 extant to Rs 240000. 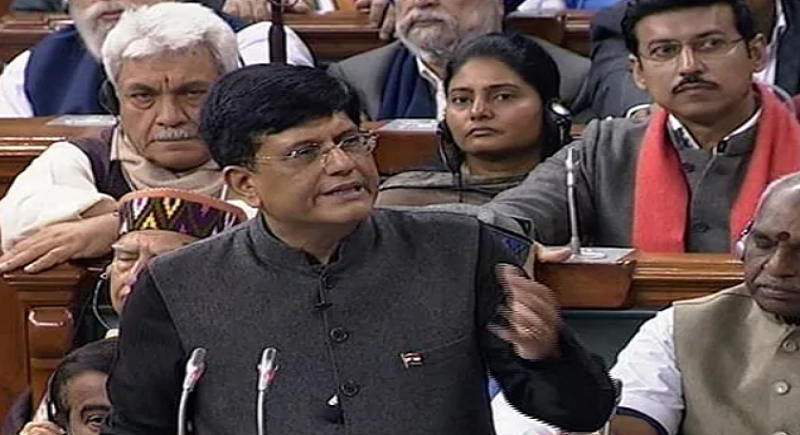 Goyal concluded his Budget speech with the quote, " Ek paav rakhta hun, hazaar raahein phoot padti hai." which literally means one step opens up a thousand roads.